Laos and Cambodia are two countries strongly influenced by Buddhism, so that travelers often see many temples with pointed roofs to the sky. The harmonious combination of 2 countries brings the oriental beauty that foreign tourists love to visit and discover. Join our tour to learn more about these beautiful countries. Collect at the aiport and transfer to the hotel with guide. In the afternoon, you will discover the site in World Heritage list - Wat Visoun (a temple dating from the XVI century and now serves as a museum for religious art), Wat Aham (a temple built in the XIX century). Continue to visit Phousi hill with 328 steps to the top will give you a panoramic view of Luang Prabang. Lunch and dinner at the restaurant in town. Overnight at the hotel in Luang Prabang. Breakfast at the hotel. In the morning, visit the oldest temples in the city: Wat Sene and Wat Xieng Thong, the monastery from the 16th century and is considered the most beautiful of Laos. Embark on a cruise upstream on the Mekong River to visit to the Pak Ou Caves, via the village of Ban Xang Hai to observe the making process of traditional rice wine called Laoh Khao. After lunch in a restaurant on the river, return to Luang Prabang. On the way back, visit the pottery village of Ban Chan. The end of the afternoon, you will continue the road to the outskirts of the city and visit Ban Xang Khong and Ban Xienglek, villages known for its wood sculptures but also for its silk shades with true colors. Dinner at the restaurant in town. Overnight at hotel in Luang Prabang. Wake up early to attend the first daily morning ritual offering food to the monk. After breakfast at the hotel, visit the colorful Dala Market, full of fresh vegetables and variety of local food available along the walkway. Ride to Kuangsi Waterfalls where you can swim or walk along the forest paths and enjoy your picnic lunch. Back to Luang Prabang and visit the interlacing village (Ban Phamon). Dinner at the restaurant. Overnight at the hotel in Luang Prabang. Breakfast at the hotel. Morning visit at the National Museum which is also the former Royal Palace. Lunch, then transfer to airport for flight to Vientaine. On arrival in Vientiane, visit the Buddha Park, a presentation of Buddhist and Hindu sculptures created by mystical monk in the park on the banks of the Mekong River. Dinner at the local restaurant. Overnight at the hotel in Vientaine. Breakfast at the hotel. Visit Wat Sisaket with thousands of miniature Buddha statues and the former royal temple of Wat Prakeo. Then visit That Luang Stupa and the Patuxay Monument well known as Vientiane's Arc de Triumph. After lunch at the restaurant, explores Vientiane by walking tour, visit Wat Ong Tue, Wat Inpeng and Wat Haisok. Pay visit to the studio of Carol Cassidy for textile collection and pass through the major commercial areas and continuing to Talad Sao. Discover the sunset on the banks of the Mekong. Dinner at the restaurant. Overnight at the hotel in Vientaine. Breakfast at the hotel. Transfer to airport for flight Vientaine / Pakse. Arrive Pakse and continue by road to visit the ruins and Champasak Wat Phu, a sanctuary of the Khmer Empire between centuries 9-13ème and other Khmer temple nearby. After lunch at local restaurant, then continue by private car to Khong Island. Arrive in Khong Island, then transfer to hotel. Dinner and overnight at hotel on Khong Island. Breakfast at the hotel. Enjoy the cruise in the wildest scope of the Mekong River. In dry season, thousands of islands appear as the name Si Phan Done. On the way, stop at the Liphi Waterfalls and the fishing village of Ban Khone. Take a short drive to the Laos-Cambodia border of Vernt Kham to see one of the wildest waterfalls in Asia, Khone Pha Pheng. After lunch at local restaurant, return to Khong Island. Dinner and overnight at hotel in Khong Island. Breakfast at the hotel. Depart for Tat Lo, through the Boloven plateau, famous for tea and coffee plantation. Explore the beauty of the plateau and visit the hill tribal villages of Katu, Alack and the Nge minority hill tribe. After lunch at the local restaurant, transfer to the return to Pakse. Dinner and overnight at the hotel in Paksé. Breakfast at the hotel. Free time in the morning until transfer to airport for flight to Siem Reap. Lunch on your own. Arrival in Siem Reap and transfer to the hotel with guide. Then visit Takeo, Ta Prohm, Srah Srang and Krovan temples. Discover the life of the inhabitants of the Green village located along the road to Phnom Krom by bullock cart. Dinner at the restaurant. Overnight at hotel in Siem Reap. Breakfast at the hotel. Visit South Gate of Angkor Thom with the famous Bayon Temple unique for its 54 towers decorated with over 200 smiling faces of Avolokitesvara, the South, the Elephants Terrace, the Leper King, the Baphuon temple, Phimean Akas. Lunch at the restaurant. Then visit to the magnificient temple of the world « Angkor Wat » and enjoy the panoramic view of sunset from the top of Bakheng temple. Relax with traditional Khmer foot massage in one hour (Stimulation of the points reflexes of the muscles with the hands to relieve the pain - Reflexo- Therapie). Dinner at the restaurant. Overnight at the hotel in Siem Reap. Breakfast at the hotel. On the road, visit the famous Banteay Srei, a jewel of Khmer art with carvings and architectural details on pink sandstone, then visit Banteay Samre temple with a central temple famous for its well preserved bas-reliefs of Vishu legends. Lunch at the the restaurant. In the afternoon, enjoy a cruise to the fishing villages in the big Tonlé Sap lake. Visit the temples of Pré Rup, Mebon, Tahom, the fountain Neak Pean and the Preah Khan temple. Dinner at the restaurant. Overnight at the hotel in Siem Reap. Breakfast at the hotel. 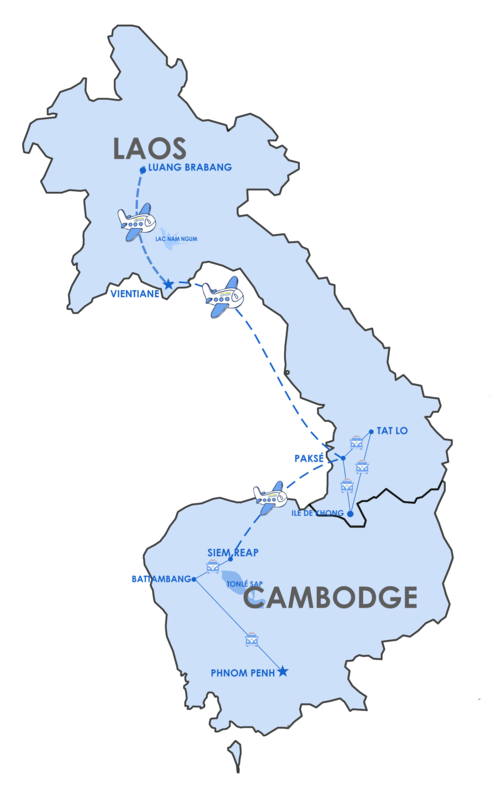 Transfer to the Phnom Krom port to take collective boat to Battambang. Arrive in Battambang, and transfer to the hotel. In the afternoon, visit to Wat Ek Phnom temples, Wat Slaket and then enjoy the Bamboo Train (local manufacture operated by a motor for short trips between 10- 20km from one village to another situated along the railway) via Khmer Villages. Lunch and dinner at the restaurant. Overnight at the hotel in Battambang.Lunch and dinner at the restaurant. Overnight at the hotel in Battambang. Breakfast at the hotel. Depart for Phnom Penh with guide. Phnom Penh, a capital of Cambodia. On the way, stop to visit Phnom Oudong – the ancient capital before creating Phnom Penh in the 16th century. Arrival at Phnom Penh and transfer to the hotel for check-in. Visit the Silver Pagoda in the Royal Palace famous for its 5000 silver floor tiles and solid gold Budhha statue and the National Museum with a collection of art sculptures presenting different periods of Khmer history. Lunch and dinner at the restaurant. Overnight at the hotel in Phnom Penh. Breakfast at the hotel. Visit the Genocide Museum "Tuol Sleng", Centre of Terrorism Choeung Ek. In the afternoon, visit the Russian Market (Tuol Toumpoung Market). Enjoy a sunset cruise on the Mekong River for an hour with a view of local at work along the banks. Lunch and dinner at the local restaurant. Overnight at the hotel in Phnom Penh. Breakfast at the hotel. Free time in the morning until transfer to the airport for flight back home. English/ French speaking tour guide. Private transportation with air-conditioned vehicle with drivers on tour. Hébergement aux hôtels mentionnes avec petit- déjeuner inclus. Hotel accommodation based on twin or double rooms sharing with daily breakfast at hotel. Domestic air tickets: Luang Prabang - Vientaine, Vientaine – Paksé with taxes included. International air tickets Paksé – Siem Reap with taxes included. Fullboard included as indicated at hotel or local restaurant on tour. Entry visa in Laos and Cambodia.